One of Yu-Gi-Oh's few Wind archetypes, it relies on destruction of the monsters in order to get new ones. Most require destruction by battle, while a few just need to be sent to the graveyard. And the other engine it runs is shuffling cards fron your graveyard back into the deck (Gusto Monstercards). This way, it always keeps the infinite flow of monsters going. In the following paragraphs I'll be explaining the Monsters, Spells and Traps of the Gusto Archetype one by one, and giving them a rating on how good they are. The card is one of Gusto's best, since it replenishes the meatwall the deck has, and gives you a draw. Also being one of the Gusto's strongest Effect Monsters, it really is a credit to the Archetype. When this card is sent from the field to the Graveyard: You can Special Summon 1 Level 2 or lower "Gusto" monster from your Deck. Main Gusto Tuner. If used for Synchro, it misses timing on his effect, but is very good when Torrentialed or Dark Holed, attacked or those things. It's a real good adition to the meatwall as well, since it has many outs for using his effect. And being a level 3 Tuner also helps it a lot. 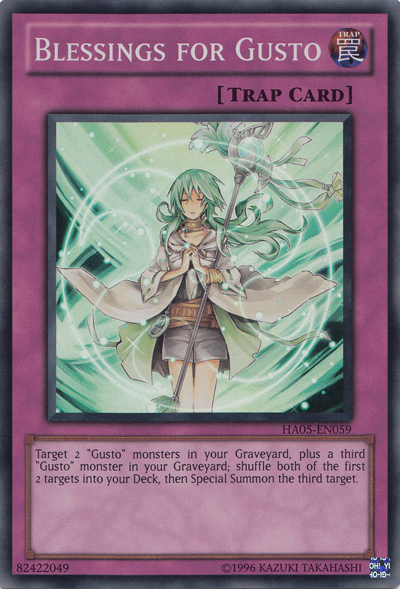 When this card is destroyed by battle with an opponent's attacking monster and sent to the Graveyard: You can Special Summon 1 "Gusto" Tuner monster from your Deck. Also one of the meatwall's chains. It allows you to easily Synchro for level 5 with Gulldo, or you use it for protection, and have it Summon Gulldo or Egul. Shame it has to be destroyed by battle, otherwise it'd be a real beauty, which by the looks it already is. The card that can get Caam on the field if you need it. Being a level 1 Tuner it also opens options for Formula Synchron, and level 5 Synchro with Caam or other cards. 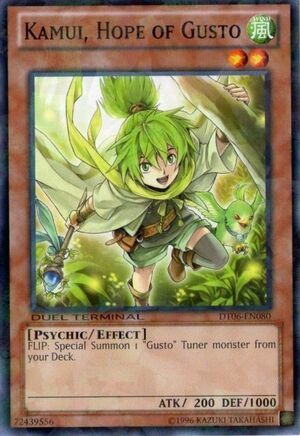 FLIP: Special Summon 1 "Gusto" Tuner monster from your Deck. Nice effect, sloppy stats, but makes up by being level 2, allowing you to get Gulldo and Synchro for level 5 instantly. Only thing is, it's a bit slow, since it has to flip for its effect to activate. Works like a charm with Kamui, but shouldn't be destroyed by battle. Best if used with Scrap Dragon's effect. When this card destroys a monster by battle and sends it to the Graveyard: You can target 1 Level 3 or lower "Gusto" monster in your Graveyard; Special Summon that target in face-up Defense Position. A good card, spams your gustos back from the graveyard, but why, why in gods name does it have to be level 5, and have those stats? If it were level 4, it’s be no more broken the Jurrac Guaiba. And the 2000 ATK doesn’t really help, for needing 1 tribute. Once per turn: You can target 1 "Gusto" monster in you Graveyard and 1 face-up monster on the field; shuffle the first target into the Deck, and if you do, negate the second target's effects until the End Phase. Gusto’s level 4 beatstick with 1800 ATK, a decent effect, but nothing too special. Only a negater, nothing more, and since it’s ignition, you don’t really want to use its effect to negate opponent’s monsters effects, but rather to return the card you have. 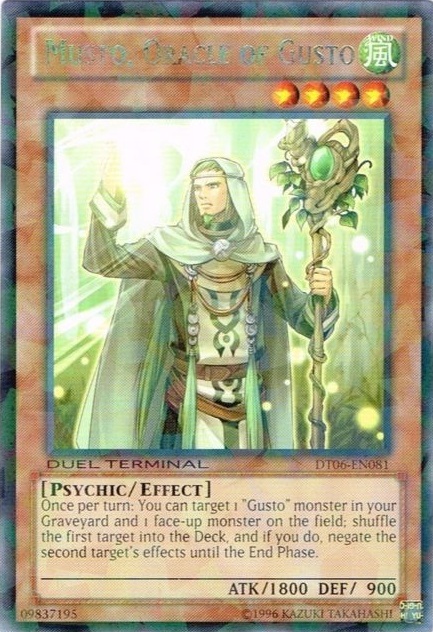 At the end of the Battle Phase, if this card is in the Graveyard because it was destroyed by battle and sent to the Graveyard this turn: You can banish 1 "Gusto" monster from your Graveyard; Special Summon 1 WIND Psychic-Type monster with 1500 or less DEF from your Deck. An ok effect, even though it costs a lot, and requires to be destroyed by battle and having a Gusto in your graveyard. But you can also banish himself, so that’s not much of a problem. Still would prefer Gulldo, Egul or Winda over Thunbolt. When this card is destroyed by a card effect and sent to the Graveyard: You can Special Summon 1 Level 5 or higher "Gusto" monster from your Deck. Nothing personal, but seriously, what the F? First, it has to be destroyed by card effect. Well, with this meta, that ain’t hard. But then it has to go to the graveyard. Well, knowing that Inzektor usually have a Dimensional Fissure, and not to mention the massive increase in Macro Decks, I can see that go wrong plenty of times. And after all that, you get to summon a level 5 or higher Gusto monster from your deck. I’m wondering why people would run level 5 or higher to begin with, so this card is not only situational, but also plain crap. Level 2 Tuner, Thunder-type, not gonna happen. When this card destroys an opponent's monster by battle and sends it to the Graveyard: You can Special Summon 1 WIND Psychic-Type monster with 1500 or less DEF from your Deck. Ok, Lemme get this straight. 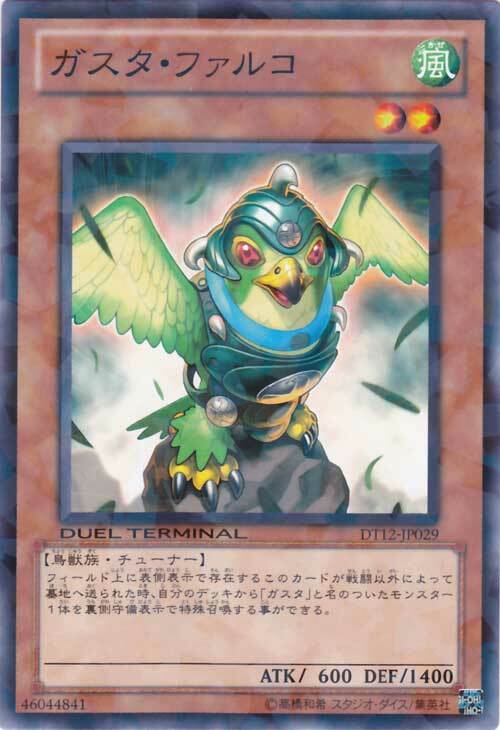 A monster with 1000 ATK should destroy opponents monsters by battle, to get a WIND Psychic monster from your deck. Which most likely is not even a Tuner. Yeah, I’d buy that. Trashcan, please. If this card is sent from the hand to the Graveyard: You can Special Summon 1 "Gusto" monster from your Deck. The effect of "Gusto Grif" can only be used once per turn. If I read this card, I’m just crying. The entire Gusto archetype is build around returning from graveyard to deck, and spamming after being destroyed by either battle or card effect. But no, they gotta make cards that have NOTHING to do with the build. It’s like making a card for Inzektor that activates when an Inzektor is returned to the hand. I know it was meant to widen the window of possibilities for Gusto, but this is just bad. Period. Once per turn: You can return 1 card from your hand to the bottom of the Deck to target 1 monster your opponent controls and 1 face-up "Gusto" monster you control; switch control of both monsters. Creature Swap. A spell in level 5 monster form. I believe I need not say more. One of the leading Gusto Synchro cards. It’s a good one, has considerable stats, and is made quite fast (Gulldo + Caam/Musto). Popping face-down cards (note: cards, not monsters or spell/traps. Any face-down card) at the cost of banishing a wind monster (again, a wind monster, not necessarily Gusto). A must in every Gusto Extra deck! Nice card, shuffle 2 Gusto back into the deck, and trash a face-up monster. And easily made with Kamui + Gulldo. Also restores a part of, in case needed, the meatwall. Indestructible by battle, and your opponent takes all battle damage. Good card, very good card. Just a shame it’s only OCG, which is also why I put it only third. But if it comes out in TCG, it’s going up to place 1. It’s level 4, so you can make it a bit hard, considering most useful Gusto’s are level 2, 3 or 4. And then the effect. Well, not the best, but I’ve seen worse. Once per turn, you can activate one of these effects. ● Detach 1 Xyz Material from this card to target 3 monsters in your Graveyard; shuffle them into your Deck, then draw 1 card. ● Detach 1 Xyz Material from this card to target 1 Non-Effect Monster in your Graveyard; Special Summon it. It’s a good card, and really does restore the meatwall, returning 3 monster to the deck. Just a shame it requires 2 level 4 monsters. Gusto barely runs level 4, and those it does run, are better of not being Xyz materials (Caam). No. Just, no. You wouldn’t waste 2 level 2 monsters for something like this. If you would, you can stop reading now and get back to learning basic plays. Target 2 "Gusto" monsters in your Graveyard and 1 card your opponent controls; shuffle both targets in your Graveyard to the Deck, then destroy the opponent's target. On first sight, an ok card. Requires 2 Gusto’s in grave, and then kills a card, regardless of what it is. Only Spell support they have, and it’s pretty ok. If you control no monsters: Target 2 "Gusto" monsters in your Graveyard; shuffle both targets into the Deck, then Special Summon 1 "Gusto" monster with 1000 or less DEF from your Deck. Not really all that good, but the best of the traps. Restores meatwall, and lets you special summon a Gusto with 1000 or less defense, also including Windaar. But requires no monsters on the field, which is hard with the meatwall going on. Well, like I said about Whirlwind, not very good. The fact why I put this below Whirlwind is because this one requires 3 targets in your graveyard, and with all the shuffling back, that doesn’t happen that often, so it’s inconsistent. During the turn you activate this card, when a "Gusto" monster you control declares an attack: Your opponent cannot activate the effects of Spell, Trap, or Effect Monsters. Well, the change your opponent has anything left is low, since there are plenty of Gusto Control decks that keep backrow in check, with Trap Stun, Heavy Storm, MST, Decree, Eguls and plenty of others (mainly staples). So this card is kind of useless, not to mention it’s a -1 for protecting your monsters 1 turn. Isn’t worth it. I have done this all by myself. All cards and pictures go to online sites, Konami and YuGiOhWikia. I’d like to devote this to coolgirlshark4, thanks to whom I was able to write this long text. If any questions, unclearity’s or suggestions arise, please pm me with your points. .... Y ADMINS NO FIX THE "[Only admins are allowed to see this image]" PROBLEMA? I liked your guide on Gustos. xD But I guess it depends on your style of playing with them. I use a Gusto Quasar deck and been testing around with them and my only dislikes is the first monster mentioned here cause I feel it slows down the deck since it has to be special summoned. I use the level 1 and 2 tuners and grif as a discard outlet for Quickdraw. 2) You are too unprofessional.. For example, please read the texts of Squiro, Codor, Grif and Reeze.. You should only state the facts, try to keep your personal feelings out of it. 3) If you mention "Fabled Gustos" as well as "Psychic Gustos", you should go deeper into detail about those two variants and why they are also played alot together with the main variant. That's all I can think of now. The info you provide is good but as always, you arent going to deep into it while you most certainly should. Try to mention Support Cards, Playstyles, etc. I believe I need not say more. But it should not be opinionated! A "guide" to building a deck should be based more on facts than on opinion. Yes he can rate cards but you should not cross the line between fact and opinion too much. Second of all, I tried to edit it once and again my connection failed me. After that I've only centered everythinng and made it look more professional. I have only cut out the first part of her guide because that was meant to be for the staff. Saying that the staff should rate your work and give feedback is unnecessary since this section is made to give feedback and our opinions on how you could improve your lesson/article. I haven't changed anything else other than some codes to make it look more professional. >_> C.C. = Male. Just going to clear up that confusion..
Ill see what I can do to fix that problem, please try to stay on topic. It is allowed to be opinionated if HE WANTS IT TO BE..... Its his guide. It seems like a really cool deck guide nice C.C I like the Gusto archetype a lot. It looks interesting and the artwork is nice.